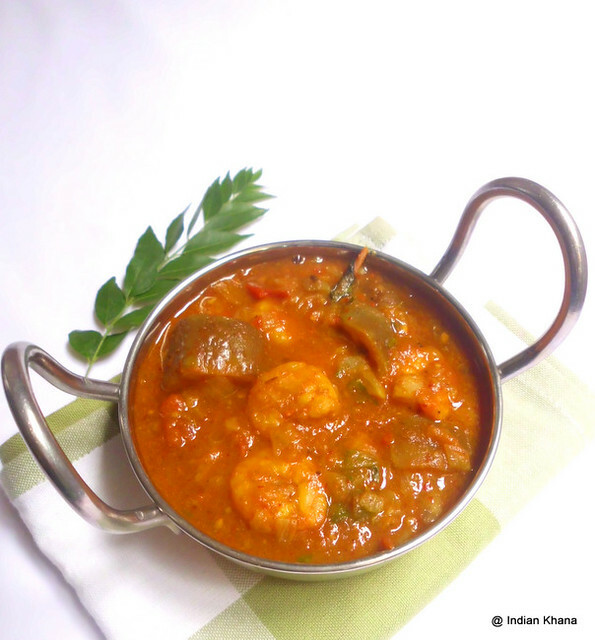 I always make Prawn Masala whenever we get prawn and mind you this when ever is really once in blue moon but then the prawn masala recipe is just so worth it to try again & again. But then I look for change and tried Prawn Aglio Oilio which I really liked it and another trial was to combine prawns and eggplant together, first I was doubtful about the combo but the curry came out really well and makes a wonderful side dish for rice or roti. 1. 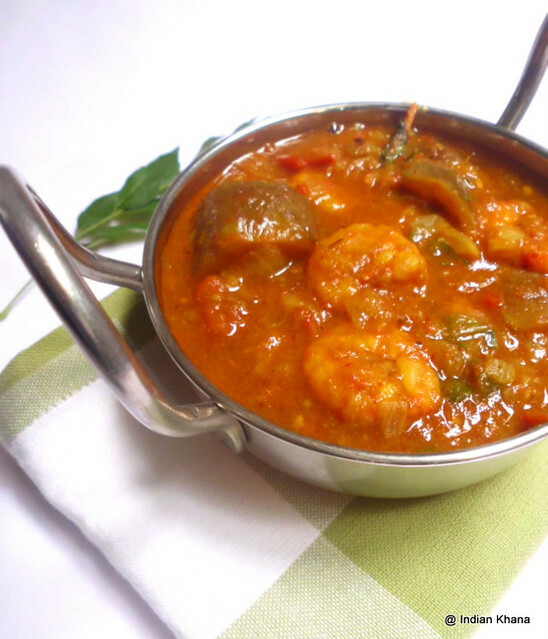 Clean, wash prawns and marinate with items listed under ‘to marinate’ and keep aside for 1-2 hours or more if you can. 2. Chop onion, tomato, green chilies, cilantro and slice brinjal keep side. 3. In a wok heat oil add hing, cumin & fennel seeds let it splutter. Add garlic and green chilies and sauté for 30 seconds. 4. Now add chopped onion and sauté until golden brown. Add chill coriander and turmeric and sauté in medium flame for 2 minutes. 5. 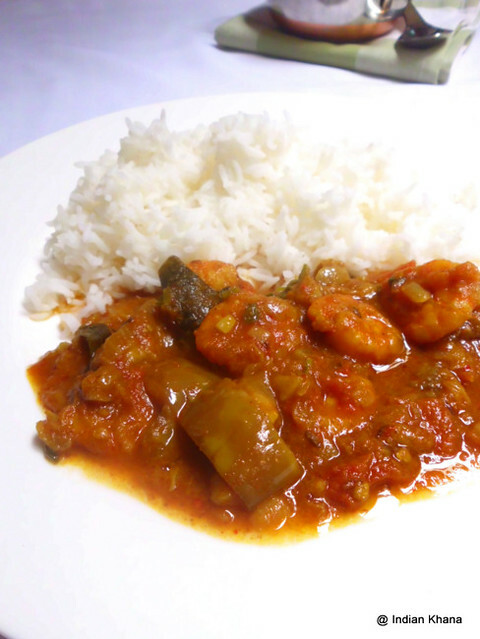 Add prawns, sauté for 5-7 minutes, now add eggplant pieces cover and cook in slow flame until prawn, eggplants get’s soft, stir in intervals. 6. Add tomato, mix well, cover and cook until tomato mashes. Add salt and cook for a minute, add water and simmer until every thing is cooked around for 10 minutes in medium flame. 7. Add garam masala and stir (adjust salt if required), add chopped cilantro cover and off flame. Serve as side dish for rice or roti/parata and enjoy this wonderful combo. 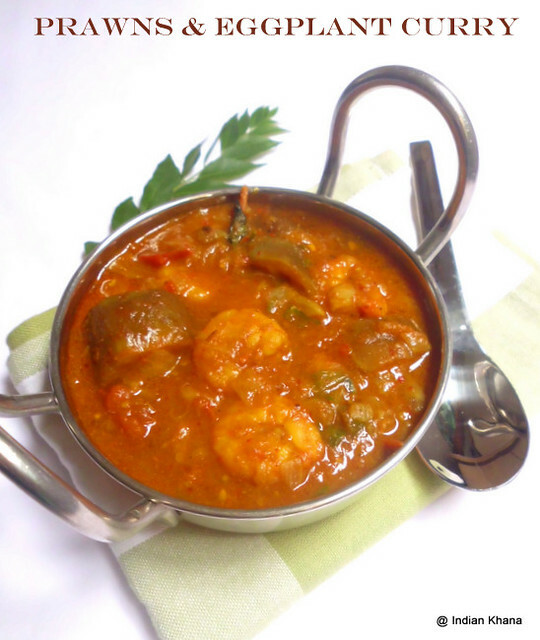 I haven't tried prawns in a curry. Lemme try it this weekend. Excited much! But is it okay to add more turmeric powder? Wish i get this curry rite now,will enjoy thoroughly for my lunch. @Sweetylady - yes you can add more turmeric powder if you wish. Very new combination.. never thought of combining the two! Looks good! thats a new combo... must be yum!